Definition at line 33 of file llpaneldatabase.h. Definition at line 42 of file llpaneldatabase.cpp. 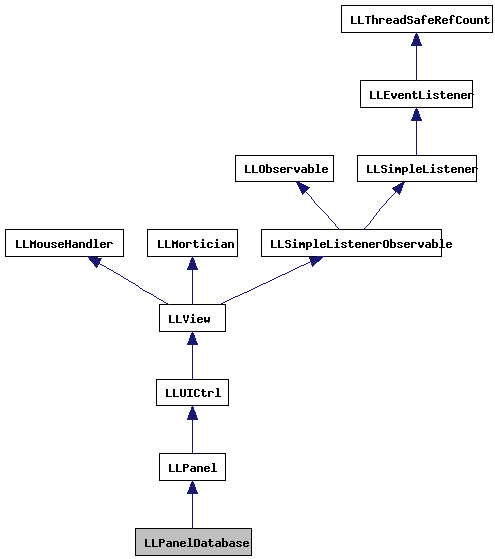 References LLUICtrlFactory::buildPanel(), LLPanel::childSetAction(), gUICtrlFactory, and onClickChangeAvatar(). Definition at line 37 of file llpaneldatabase.h. Definition at line 91 of file llpaneldatabase.cpp. References LLUUID::asString(), LLPanel::childGetText(), gSavedPerAccountSettings, gSavedSettings, llendl, llinfos, mAvatarKey, and LLControlGroup::setString(). Definition at line 109 of file llpaneldatabase.cpp. Definition at line 86 of file llpaneldatabase.cpp. Definition at line 115 of file llpaneldatabase.cpp. References FALSE, onPickAvatar(), LLFloaterAvatarPicker::show(), and TRUE. Definition at line 121 of file llpaneldatabase.cpp. Definition at line 68 of file llpaneldatabase.cpp. 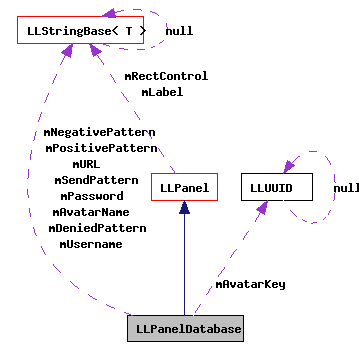 References LLPanel::childSetText(), llendl, llinfos, mAvatarName, mDeniedPattern, mNegativePattern, mPassword, mPositivePattern, mSendPattern, mURL, mUsername, refresh(), and TRUE. Definition at line 53 of file llpaneldatabase.cpp. References LLControlGroup::getString(), gSavedPerAccountSettings, gSavedSettings, llendl, llinfos, mAvatarKey, mAvatarName, mDeniedPattern, mNegativePattern, mPassword, mPositivePattern, mSendPattern, mURL, mUsername, and LLUUID::set(). Definition at line 53 of file llpaneldatabase.h. Referenced by apply(), and refresh(). Definition at line 52 of file llpaneldatabase.h. Definition at line 60 of file llpaneldatabase.h. Definition at line 59 of file llpaneldatabase.h. Definition at line 56 of file llpaneldatabase.h. Definition at line 58 of file llpaneldatabase.h. Definition at line 57 of file llpaneldatabase.h. Definition at line 54 of file llpaneldatabase.h. Definition at line 55 of file llpaneldatabase.h.